I am sharing a card I made 2 weeks ago during Crafting Happy Hour at local wine shop. We used Bella and Friends stamp set. I love this set and needed to have it right away as my dog name is Bella. 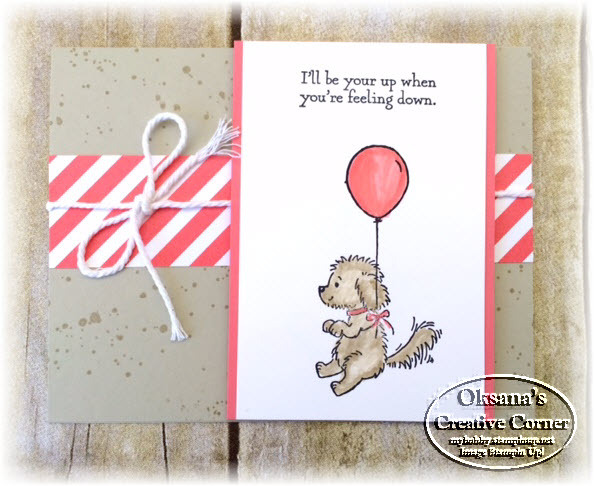 We created 4 cards using this stamp set, but this one may be my favorite. I love the sentiment on it: I I'll be your up when you are feeling down. This image on a stamp has a parrot, but I cut stamp in 2 pieces so I can you Bella just with balloon. Bella and balloon are both colored with blander pen and ink pad.